Many health problems have been linked to food intolerance - common everyday problems like migraines, aching joints, fatigue, gastrointestinal disorders, eczema, hyperactivity/ADD, asthma, and even obesity. 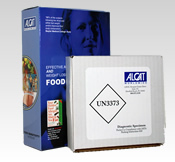 The ALCAT test will identify which foods may be triggering YOUR problems with a simple, take home finger stick blood test. Your results will show you which foods you should avoid, which foods to minimize, and which foods you can eat in abundance. Results include a booklet with a suggested food rotation plan. 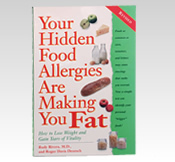 Your Hidden Food Allergies Are Making You Fat by Rudy Rivera, MD and Roger Davis Deutsch $16.95. Now You Can Lose Weight and Feel Great! Do you know that there is a scientifically verified test and eating program that can change your life? It's simple: Discover your food allergies and intolerances, eliminate these trigger foods from your diet, and shed pounds effortlessly!